Exact to within 6 millimetres, the Scottish Ten 3D model provides vital conservation and maintenance data as the Opera House enters a decade of renewal. The new virtual Opera House will also be invaluable in terms of opening the world's busiest performing arts centre up to people wherever they are and whenever they would like to visit. 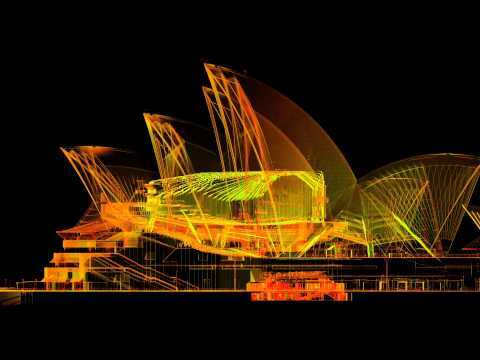 In April 2013, a team of digital-documentation experts from the Scottish Ten project took more than 800 laser scans of the interior and exterior of the Opera House, and 56,000 digital photos, documenting 13 billion measurable points on the structure using cutting-edge, laser-mapping technologies. The Scottish Ten is an ambitious, five-year collaboration between specialists in heritage digital documentation at Historic Scotland, experts in 3D visualisation at The Glasgow School of Art's Digital Design Studio and not-for-profit digital heritage organisation CyArk. Two Scottish 3D scanning projects have showcased the best of the technology and how it is used in the heritage industry - a major growth area for 3D scanning and contactless metrology. The Scottish Ten project, which aims to record all five of Scotland's World Heritage Sites and five international heritage sites using laser scanning for conservation purposes, has unveiled its plans to produce a map of the Sydney Opera House. The group is going to mark the architectural icon's 40th anniversary with a precise 3D-scanned map produced using more than 800 laser scans and 56,000 digital images. Sydney Opera House was declared a UNESCO World Heritage site in 2007 and was selected to be part of the Scottish Ten five-year collaboration between digital documentation in heritage specialists at Historic Scotland, Glasgow School of Art's Digital Design Studio's 3D visualisation experts and not-for-profit organisation CyARK. The building is the only one to be selected by Scottish Ten to have been built in the 20th century, having been opened by Queen Elizabeth II in October 1973. Scottish Ten has also scanned Scottish heritage sites the St Kilda ruins, New Lanark's 18th century mills and the Heart of Neolithic Orkney as part of the ongoing scheme. Chief Executive of the Sydney Opera House Louise Herron said: "When the Scottish Ten came to us with the idea of creating an exact 3D rendering of the Opera House, I knew how valuable that information would be in our conservation efforts. But I was astonished by its potential to help us in many other ways. We will use it in our education programs and to engage with new audiences online. People will be able to explore the Opera House no matter where they are. We already have applications in development for public release during our 40th Anniversary year." And it is not just Historic Scotland and the Scottish Ten that are using 3D scanning technology to record the exact physical dimensions of large-scale historic structures, as Newcastle-based Digital Surveys has been in Dundee working on RRS Discovery, according to an STV News report. The ship - which is famed for traversing the famously treacherous Antarctic route, transporting famous explorers to the frozen South Pole - has been reproduced digitally in order to ensure efforts to conserve the 113-year-old vessel are as successful as they can possibly be. A 3D laser scan of the ship which forms part of the UK's historic fleet collection has produced this vital information, which will be used by the Dundee Heritage Trust (DHT). DHT took the chance to have Discovery captured in 3D while it was in dry dock preparing for the city's waterfront development to reach completion. Digital Surveys' project will result in a photo realistic model of the external hull, top deck and masts, while an online virtual tour of Discovery will be built using the information, along with a scaled-down model of the ship. The 3D scan will highlight any deformation or movement in the ship that will serve as a crucial baseline for future monitoring and conservation efforts. It will also inform future engineering proposals with regards the presentation of RRS Discovery. Chief Technology Officer of Digital Surveys Ben Bennett said: "Digital Surveys are delighted to be working on such a prestigious heritage project. We will be using the latest 3D laser scanning technology to digital capture the vessel creating a virtual snapshot in time. "Laser scanning is perfect for this type of project capturing billions of points of information and allowing many different deliverables to be created. This should provide a fantastic 3D data resource in the on-going preservation of the RRS Discovery." DHT's Operations Director Mark Mumsie added: "RRS Discovery is showing signs of structural movement which is evidence in the form of cracks opening between timbers at various locations around the ship. "This project will create an accurate and complete 3S digital record of the external shape of the vessel and provide evidence of any movement or structural deformation. We are extremely grateful for the support of Museums Galleries Scotland who have provided funding for this study under the Recognition scheme."